Here, for the first time in history in the 64 years since Michael Ventris’ astonishing feat of the decipherment of almost the entire Linear B Syllabary in 1952, with subsequent updates and tweaks introduced by his colleague, Prof. John Chadwick, over the decades to come, and with further refinements introduced by Prof. Thomas G. Palaima in the 1990s, is the completely revised Table of Mycenaean Linear B Syllabograms, showing all 61 syllabograms identified to date, and for the first time ever, the 31 Supersyllabograms, which no one has ever seen except on this blog, since it is we, my colleague, Rita Roberts and myself, who discovered them in the first place. The supersyllabograms as we understand them are bound to have a tremendous impact on our understanding of just what the Linear B syllabary is meant to represent. As you shall all discover sometime early on in 2015, the Linear B syllabary is not simply just a syllabary, but much more than that. Linear B is a shorthand syllabary, the first and last of its kind, as well as the first methodically organized system of shorthand in human history until the advent of modern shorthand secretarial systems in the nineteenth century. 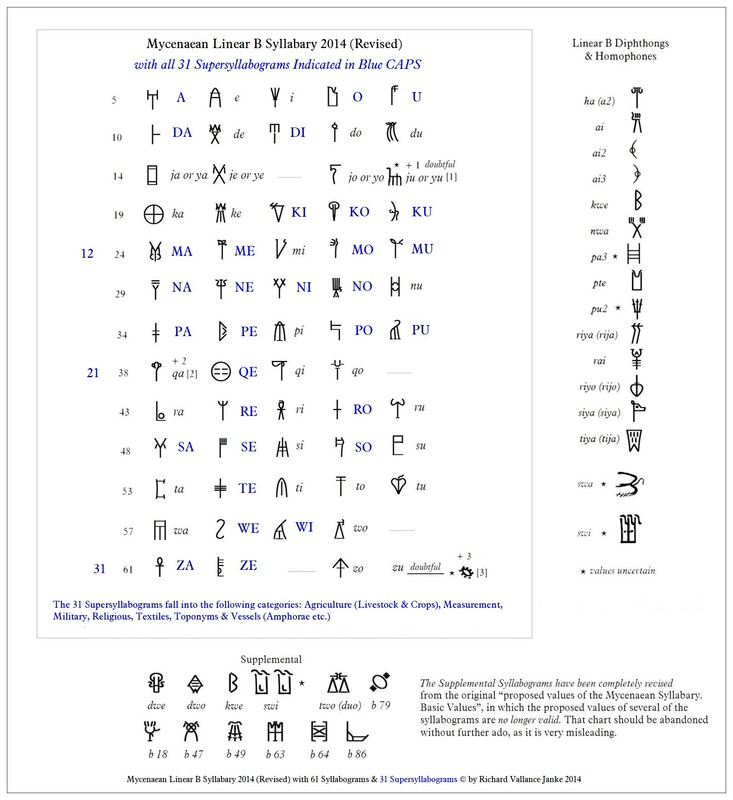 As it stands now, we believe that the 31 Supersyllabograms we have already discovered, isolated and defined, right down to 27 (the other 4 remaining undecipherable), are bound to make big waves in the Linear B research community when we finally publish our in-depth, comprehensive research study on them sometime in 2015, since they can account for a large chunk of the remaining 10 % or so of Linear B recalcitrant to decipherment... until now, that is. A supersyllabogram is the first syllabogram, in other words, the first syllable of a Mycenaean Greek word in Linear B. All subsequent syllabograms or syllables are suppressed by the scribe, who uses the supersyllabogram in place of the Linear B word spelled out completely. Thus, as you can readily see, supersyllabograms are in fact a form of shorthand, not shorthand as we understand it nowadays, but shorthand nevertheless. Beyond this, I cannot say more here on this post without getting into the nitty-gritty details, but if you are a Linear B researcher or translator, and are truly serious about the newest developments in the field of Linear B studies, then I strongly urge you to read all the posts on supersyllabograms on our blog, as per our instructions above. Believe me, the reading will make for a real eye-opener. As with all new breakthroughs in any field of research, in this instance, ancient linguistics, our Theory of Supersyllabograms is bound to be controversial, but that is precisely what we expect it to be. Some in the field of Linear B research will pretty much agree with us, some will agree in part, others will cast real doubt on our findings and still others will undoubtedly cast our theory straight overboard. But this is what scientific research is all about. Even if we are proven to be “right” or “wrong”, wholly or in part, or whatever may come of our bold venture into the “unknown”, one thing is certain. Things will never be the same after this! 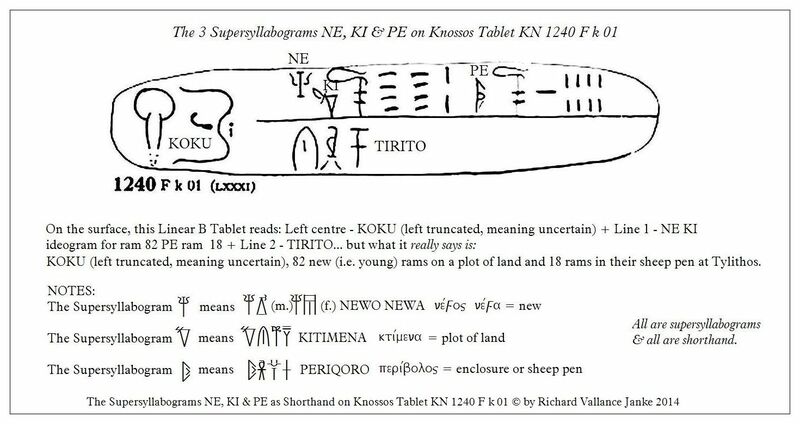 As for myself, I have tried and tested our theory against hundreds of Linear B tablets, and in almost every single case, the “meanings” of the supersyllabograms stand the acid test. They hold up, they are consistent, and they make perfect sense in the specific contexts in which they appear on the Linear B tablets where they are found. If you want to check this all out on your own, go right ahead. Please be our guest! Read all the posts under the Category SUPERSYLLABOGRAMS, and please feel free to get back to us, comment on any and all posts you feel should be commented on or critiqued, and we promise to get back to you. Hi Richard, Maybe you would like to know that I went to Heraklion Museum Crete yesterday .I left all your details with them at the Museum Office in the hope you will receive some response from them ,well they will look at your blog I am sure. I saw quite a few of the Knossos Linear B tablets and was astounded at how small they were. Its unbelievable how the scribes wrote on them at all so now I understand why the SHORTHAND ! O.K. I will try and telephone them, but it maybe next week now as I don’t think the office staff work week ends. PS I did manage to get photo’s of some of the tablets. We had a great day there. OK! Sounds great! Anyway, Rita, I think it is best we give them plenty of time, and allow them to ABSORB all this stuff about supersyllabograms, because it is a LOT to take in. So just put out tentacles, but be sure to let them know I have provided a direct link to them right away. Also you might want to tell them that I am MORE willing to show them our research article on Supersyllabograms BEFORE it is published online sometime in the spring or summer of 2015. That way, they PROBABLY will get all hot and bothered and want IN ON THE FUN (you see!… you SEE), and THEN we will GET THE ATTENTION OF THE ENTIRE WORLDWIDE LINEAR B COMMUNITY. Clever ploy, don-t you think… For now mum-s the word, as if… But if we play our ACE cards right and Lord knows we have plenty of them now (31 to be exact! ), THEN just you wait and see. I think I know where I as the train conductor and you as the engineer are going to take THIS particular train! Ha ha! THIS IS OUR BIG BREAK, and I am thrilled you saw that for yourself EVEN BEFORE I did. Well, I knew it was, but I never thought to contact the Herakleion Museum. You have outfoxed me again, you naughty old fox. Ha ha! Leave it to a professional archaeologist to realize the FULL significance of our discovery. Come to think of it, one of the perspectives that will have to be investigated in our article is that of the archaeologist RE the tiny size of the tablets, and THAT is YOUR IN! WOW! I can hardly keep from jumping up and down, I am sooooooo excited! I am always like this, anyway, just a little boy at heart. I still feel like I am about 10 years old most of the time. But you have already guessed that by now, if not some time ago!